My mother sure wanted to make a statement with her only son. Yes indeed, yours truly was born on Leap Day. Having a birthday every four years ensures not only that I stay forever young, but also the Gregorian calendar we use stays on track. So what’s up with the extra day this year? We are led to believe that it takes exactly 365 days (1 year) for the Earth to revolve around the Sun. The reality is that one full Earth revolution around the Sun is approximately 365.24 days. Quick math says we tack on day 366 every four years. What if we ignored February 29th? For starters, Leap Day babies like me would have been born on March 1st. Also, the Gregorian calendar would be off by 24 days every 100 years. Nearly a month! If you’re late to the leaf peeping party, you may want to head south. Officials at Fort Huachuca captured some of the changeover in Huachuca Canyon last week. 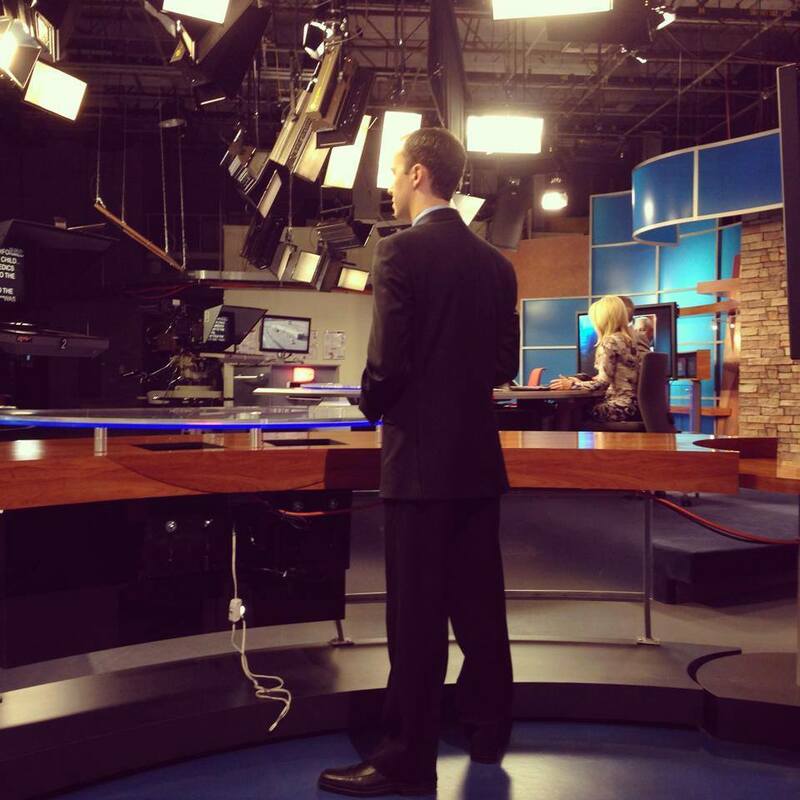 Meanwhile, Bryan and Wendy were able to capture the last of the peak foliage atop Mount Lemmon. Peak colors have come and gone for Mount Lemmon, Mount Graham and the White Mountains, which is typical for early November. Foliage is starting to max out in the Santa Rita & Huachuca Mountains. Madera Canyon will likely have peak colors for the next few weeks, with the Huachucas possibly lasting into Thanksgiving. A few places that should be spectacular include Ramsey Canyon Preserve and Huachuca Canyon. This serves as the final Fall colors report for 2015. As always, props to all of you for sharing your Fall color photos & logging on the last several weeks! Many of you made the trek up to Mount Lemmon over the last week. A huge thanks to everyone for sharing your photos with us! Fall colors put on quite a show, from Bear Wallow to Marshall Gulch. Time’s running out to see Autumn in all its beauty. Click here to see my “Hittin’ the Trails” report on the three Fall color hot spots in the Catalinas. For Mount Graham & the Whites, colors are coming to a close. 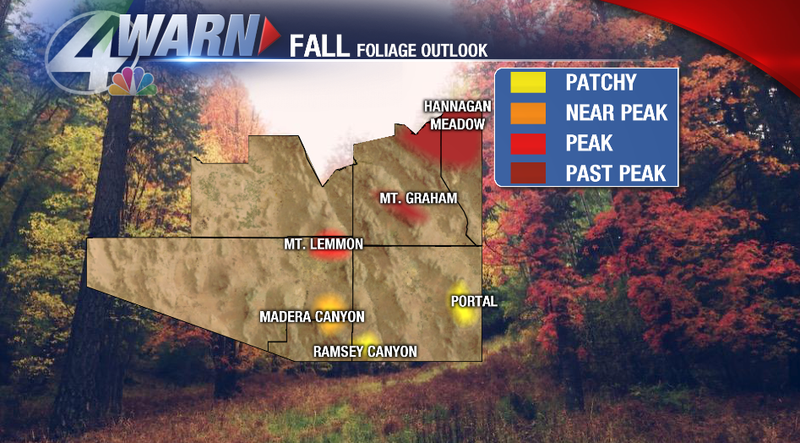 Foliage is at peak around Summerhaven right now, but heads toward past peak territory by Halloween weekend. Now the focus of attention turns to the southern Sky Islands, specifically Madera Canyon and Ramsey Canyon. The latter’s one of my favorites & usually peaks in early to mid November. Keep the Fall color pics coming! Upload them to my Facebook page, tweet me or email me. During my time off late last week, the Beamish family made the annual pilgrimage to Mount Lemmon in search of Fall colors. We were not disappointed! Best colors I found were in the Bear Wallow area & Mount Lemmon trailhead by UA SkyCenter (past Ski Valley). 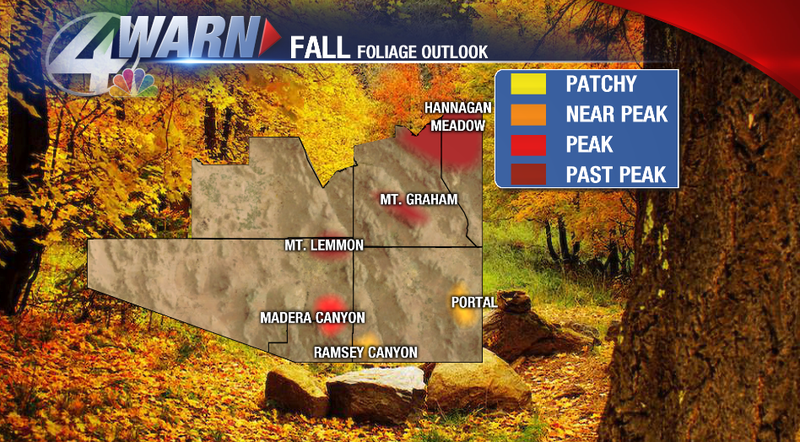 Safe to say we’re near peak atop Mount Lemmon & likely reaching max colors as early as this weekend. Patchy colors are trickling into the foliage on the Santa Ritas, Huachucas and Chiricahuas. After this weekend, the White Mountains probably start to head into past peak territory.